During the winter months when the weather is cool and there's a higher chance of rain, we tend to neglect our feet. Rugged up in socks, stockings, boots and slippers to keep them warm, our feet remain hidden away until the sun is shining again. As soon as spring is in the air, we pull out our thongs, sandals and peep toes and then there's a mad rush of polishing and buffing to make our feet pretty again. Invest in a warm, comfy pair of slippers: After being in a pair of boots all day, it's a nice feeling to come home and slip on a soft pair of woolly slippers to nurture your tired feet. Moisturise, moisturise, moisturise: After a shower or before bed, have a tub of moisturiser next to your bed and lather up to ensure your feet stay soft and supple. 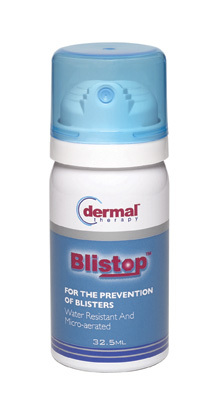 Keep a can of Blistop in your handbag: Save yourself from those dreaded new boot blisters. You spend a fortune on a beautiful pair of new boots and the last thing you want is for them to cause blisters and pain. By keeping Blistop in your bag you'll have your blister prevention spray on hand whenever you need. Indulge in a DIY foot massage: After wearing heavy shoes all day, make your feet feel great with a gentle massage. Even better if you can get someone else to do it for you! Exfoliate: In summer your feet get a natural exfoliation from the sand at the beach. To keep up that hard work make sure you pay special attention to your feet when exfoliating in the shower. Invest in the perfect boots: Buying a new pair of winter boots can be a hard choice. Ensuring you love the colour, heel height and length of the boot will be your priority. But don't forget to check the quality and the small but important details, for example if you're going to be wearing thick socks with your boots make sure you try them on with thick socks to ensure you're buying the correct size and avoid future discomfort. Be good to your heels: If a long hot summer has your heels looking tired and worse for wear with dry, cracked heels, a cooling and soothing aid such as Dermal Therapy Heel Balm will fix them right up. With ingredients such as Shea Butter, Aloe Vera and Vitamin E plus added exfoliation action, your heels will be visibly softer in just three days. Keep your feet active: Just because the sun goes to bed earlier and it's cooler in the mornings doesn't mean your feet should stop moving. Keep your feet active by taking the steps to work rather than the lift or sign up to a dance class to really make your feet feel alive. Avoid embarrassing odour: If sweaty, smelly feet are a problem for you, apply a foot gel to keep them feeling beautiful. Exclusively formulated to protect feet from the micro-organisms that cause foot odour, Dermal Therapy Foot Gel will leave you feeling confident and invigorated, with dry odour-free feet. With a refreshing combination of essential oils including tea tree oil, peppermint and eucalyptus oil your tootsies will feel hydrated and nourished whilst smelling refreshed.